Award-winning writer Susan Abulhawa is the author of Mornings in Jenin and The Blue Between Sky and Water. She is the founder of the NGO Playgrounds for Palestine. 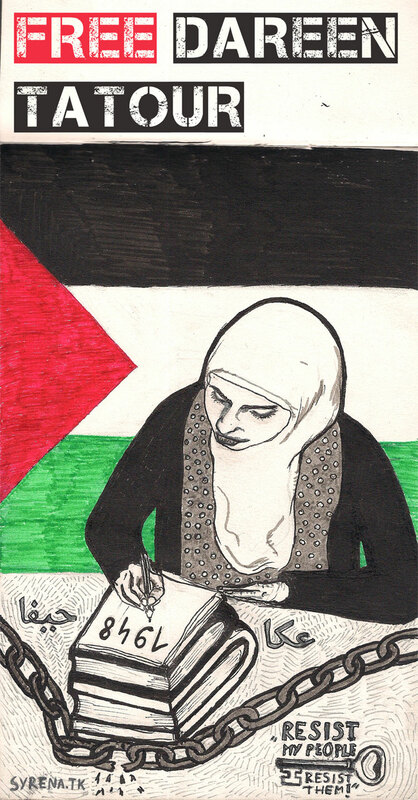 In the interview below, Abulhawa reflects on the case of Dareen Tatour, the Palestinian poet arrested for incitement who is currently under house arrest. Jessica Rohan: Israel has arrested approximately 400 Palestinians for incitement over social media since the uprisings last October. At the same time, we are seeing an escalation in the government’s tactics against the Boycott, Divestment and Sanctions movement. Why do you think that Israel is apparently redoubling its efforts to crush non-violent resistance? Susan Abulhawa: One of the important factors that have enabled Israel to destroy Palestinian society and colonize our land has been their ability to control the narrative. For nearly seven decades, the story of Palestinian displacement, dispossession, disenfranchisement and oppression has been masked with Israeli hasbara and perverted by racist colonial notions of entitlement, ethnoreligious supremacy, and divine favor. In recent times, the internet and social media has created a venue for global information sharing that bypasses the traditional gatekeepers of knowledge, whether newspaper editors, publishing houses, film distribution companies, or television producers. Thus, for the past decade, ordinary people around the world, for the first time, have been able to access news and information previously censored or put out of public reach. Such exposure of the truth has shifted the narrative and weakened Israel’s ability to manipulate public opinion. As the reality of conditions on the ground reaches further into global consciousness, international attitudes are turning against Israel. And as Israel has no legitimate counter argument to a native people’s struggle for liberty and justice, their only option is to forcefully mute Palestinian voices. It is a desperate, but ultimately futile, errand of all colonial powers. JR: Much of the case against Dareen seems to hinge on the way in which translators interpret her poem for the courts. You’ve expressed frustration in the past that your writing has frequently been mischaracterized. Do you feel there’s an additional layer of difficulty for artists holding an identity that has been highly politicized, as Palestinians do, to have their work received as art rather than a political missive? SA: Art and politics are not mutually exclusive. Political art is still art, sometimes more powerfully so. The case against Dareen does not hinge on translation, even if mistranslated words are used to satisfy legal requirements, as Israel frequently twists and falsifies documents to incarcerate Palestinians. Dareen is being punished because she is a Palestinian who dares to be proud, defiant, strong, and unbroken in the face of a system that institutionalizes the idea that she is a lesser human. JR: How can we, as an international community, continue to support artists like Dareen, as well as ordinary citizens, facing repression or government backlash for expressing their ideas? SA: Like this. By keeping her story in the news, exposing the injustice and hypocrisy of her detention. Lending her our moral support, our outrage, our solidarity. Insisting that individuals and organizations dedicated to free speech take up her cause, because ultimately it is the cause for all of us to have the freedom to write, speak and create art without fear of persecution by the state.